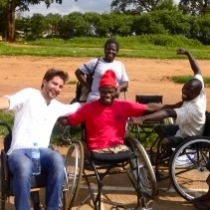 Dane Macri (Gulu Disabled Persons Union - GDPU): Dane studied at the University of Windsor, where he received degrees in the Arts and Science and Education programs. Prior to his fellowship, Dane worked as a teacher and a support coordinator with the organization Community Living Windsor, working with adults with intellectual and physical disabilities. His passions for advocacy and justice have taken him to Haiti and Northern Uganda working in education and various development projects. MOVE ASIDE KELLY CLARKSON, WOMEN WITH DISABILITIES IN NORTHERN UGANDA REALLY KNOW ABOUT BEING “STRONGER”!